Southern Illinois University Edwardsville College Student Personnel Administration (CSPA) graduate students are refining their leadership and organizational skills, building professional networks and developing personally as they take a step outside their comfort zones and complete competitive field placements in seven states across the nation. CSPA graduate students are currently placed at 12 institutions, including Florida International University, University of Massachusetts Lowell, Washington University in St. Louis, Randolph Macon College in Virginia, Cedar Crest College in Pennsylvania and the University of Illinois-Urbana Champaign, among others. Groveland native Chelsea Gilles was drawn to Cedar Crest College for both the professional opportunities it held and the personal perseverance it would require to spend a summer that far from home. Gilles’ summer placement is through the National Association for Orientation, Transition and Retention (NODA). Upon completing her degree, she aspires to work in either student success of first-year experience areas of higher education. Conversely, Mason Prata, of Haverhill, Mass., is spending his summer closer to home as he works at UMass Lowell. Prata’s summer placement has boosted his confidence, and offered experience in effectively navigating the various positions and roles that everyone plays among a large staff. 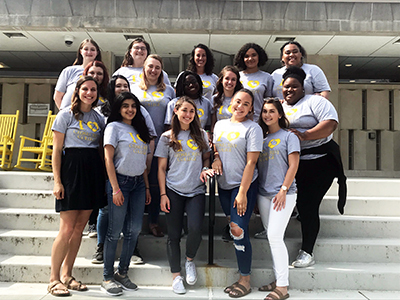 The SIUE CSPA program is one of the few programs in the region to offer placements at professional colleges, community colleges and historically black colleges and universities (HBCUs). According to Sasso, CSPA students who engage in rigorous field placement opportunities are often complemented by additional experiences within graduate assistantships in student affairs at SIUE or at neighboring partner institutions in the St. Louis Metropolitan area. Photos: SIUE College Student Personnel Administration graduate student Chelsea Gilles stands (far left front) with fellow student orientation leaders during her summer field placement at Cedar Crest College in Pennsylvania. 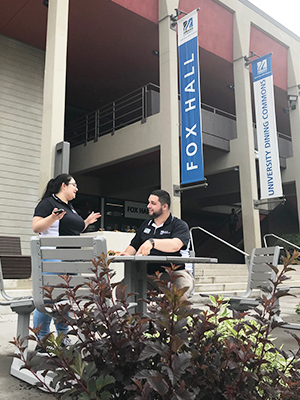 SIUE College Student Personnel Administration graduate student Mason Prata secured a competitive national field placement at UMass Lowell.